Eight car rental Bergamo Airport companies operate desks at the airport. Get a quote today and see how much cash you can save. 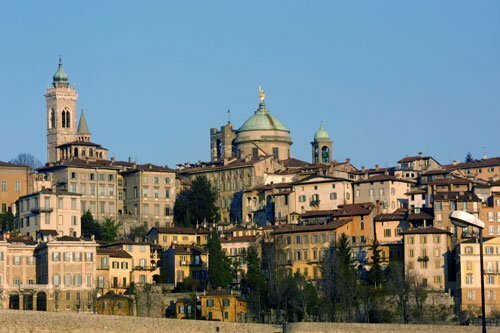 Bergamo can be found in Lombard, 40 km’s to the north east of Milan. We run a price compare service here to ensure excellent offers for our customers. This means that all of the greatest car rental Italy deals can be compared right here all in one place. What you get when you hit search is a complete listing of all the Bergamo rental cars currently accessible from the various companies. In the past you may not have had time to check around for the best prices and taken the very first deal you found. These days you are able to put in the exact same amount of effort but actually get quotes from a number of businesses at the same time. Don’t delay…find a great offer today. You can also pickup a car hire Bologna Airport deal if you are arriving there as it’s just a two and a half hour drive from Bergamo. A car hire Venice Airport deal can also be arranged with traveling distance about the same. The airport serving the area is known as Orio al Serio or simply Bergamo International. It is used by numerous travelers wishing to get to Milan. It primarily serves low cost flights with Ryanair supplying several routes. It offers bargain access to Milan for the budget conscious traveler. Bus providers such as Terravision operate regularly. It’s about a one hr drive. Another option is to get a bus to Bergamo and grab a train to Milan which costs just 4 euro. There will also be buses going to the Dolomites with stops at Bolzano, Santa Christina, Merano and a lot more. Regardless of whether you’re searching for simple access to ski locations such as Valle di Susa, Andermatt, or Champoluc or just a low cost method of reaching Milan, then Bergamo may be the airport for you. With airlines such as Ryanair continuing to expand their base at Bergamo the long term future for the airport is bright. As flights numbers increase at the airport so too must the services being offered by nearby agencies. There’s more competition than ever before between vendors as they battle for your custom. Check out our superb value Bergamo car rental prices today. A large demand is great news for the customer as companies cut margins to come out at number one meaning value for your money. If you are arriving in the north west of Italy then consider a car hire Turin Airport deal.